(Nanowerk News) Three-dimensional (3D) integration of various materials on top of bulk silicon could be the best answer for cost-effectively marrying optical devices with electronics. A*STAR researchers have used this approach to create a photodetector system for optical communications on a silicon chip ("Three-dimensional (3D) monolithically integrated photodetector and WDM receiver based on bulk silicon wafer"). As computers become increasingly powerful, there is a need to find elegant ways to combine electronics and high-speed optical interconnect technology to meet the growing demand for ever faster data processing and communication. “We believe that, in the future of on-chip and chip-to-chip communication, opto-electric integrated circuits on silicon will be a key technology to realize high-speed, low-power and low-cost chips,” explains Junfeng Song from the A*STAR Institute of Microelectronics. To date, most attempts to make hybrid electronic-optical silicon chips have relied on silicon-on-insulator (SOI) technology in which an insulating layer of silicon dioxide is formed on a silicon wafer. While this approach works well, it has the disadvantage of being very expensive — SOI wafers cost about ten times more than bulk silicon wafers. SOI wafers also suffer from poor thermal conductivity, making it difficult to dissipate heat from devices. The team instead decided to explore the use of conventional bulk silicon wafers, which are a natural platform for microelectronics, but then fabricate optical devices in layers integrated on top of the wafers, resulting in a 3D design. 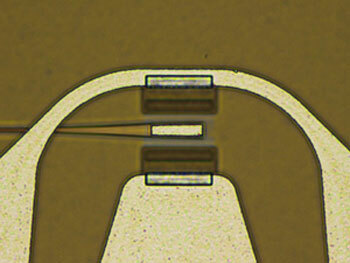 Song and co-workers demonstrated this concept by fabricating an integrated photodetector system. A germanium detector was built directly on top of a silicon wafer (see image) and fed with an optical waveguide and grating coupler formed in silicon nitride. The researchers tested the detector and found it was capable of handling data at speeds of 10 gigabits per second per wavelength channel. The team is confident that this can be pushed to much higher speeds. According to Song, the next challenge is to make more sophisticated integrated systems featuring more optical devices and more electronics. Possibilities include adding optical modulators, variable optical attenuators, optical switches, electronic amplifiers and electronic drivers to the chip circuitry. Other plans are to experiment with using alternative materials on top of the silicon, such as aluminum nitride, which has electro-optic properties and could bring new functionality.